Dr. Sanam Hafeez, the founder of Comprehensive Consultation Psychological Services (CCPS), has made it her mission to support mental health advocacy, special education, employee accommodation, and the needs of all those suffering from a wide range of psychological issues. At CCPS, she has gathered a diverse team of school-, clinical-, and neuro-psychologists, psychometricians (experts in testing), as well as an impressive administrative staff who help make everything run smoothly. Having such a diverse team allows her to integrate a variety of testing and assessment tools for the best analyses and outcomes. 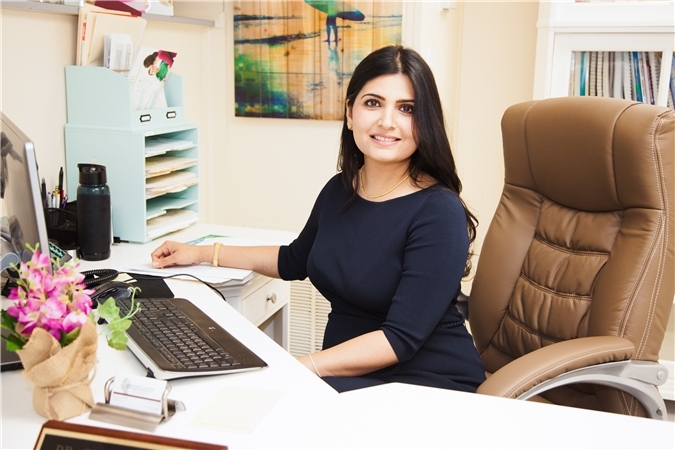 With a doctorate from Hofstra University, and post-doctoral work in neuro-developmental psychology at Coney Island Hospital, Dr. Hafeez takes an interdisciplinary approach to diagnosis. She defines neuropsychology as “a marriage of neurology, psychiatry, and behavioral health” which can set many wheels in motion for people suffering from autism, PTSD, learning disabilities, dementia, traumatic brain injury, and other brain-related disorders that can’t always be diagnosed from MRIs or CT scans. The interdisciplinary nature of the science allows clinicians like herself to design thorough, individualized, viable treatment plans. Her success has made her a sought-after expert in television, media, and print. You may have seen Dr. Sanam Hafeez on the Dr. Oz show discussing the link between ADHD and the use of technology, on CNN discussing depression and anxiety, or in Fortune magazine discussing the use of mental competency tests in corporate offices. She’s appeared on all the major networks, and has contributed to newspapers and journals both online and in print, including WebMD, Yahoo!, MSN Health and Lifestyle, Business Insider, and US News and World Report. She has also appeared in court as an expert witness in cases involving child custody, medical malpractice, immigration, and both civil and criminal matters. Outside of CCPS, Dr. Sanam Hafeez continues to advocate, lobby, and educate. At Columbia University, she has a faculty appointment in the Ph.D. program in clinical psychology where she supervises graduate students in neuropsychological testing and assessment. She’s written several scholarly papers on behavior modification, learning disabilities, and PTSD, as well as position papers lobbying CUNY to waive standardized test requirements for students with disabilities. In New York City, she and her team provide fitness-of-duty tests for the police, fire department, Department of Correction, and the Port Authority. Dr. Sanam Hafeez’s credentials speak for themselves. She is a member of the New York State Psychological Association (NYSPA) and the Association of Behavioral and Cognitive Therapies (ABCT). She is a New York State licensed psychologist as well as a NYS licensed school psychologist. She’s been appointed to New York City’s prestigious 18-B Assigned Counsel Plan, which provides quality legal and professional services to the indigent accused. Above all, she is a highly-trained CBT clinician, whose first focus is on diagnosis, accommodation, and treatment.